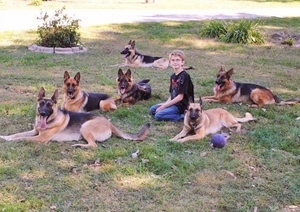 My name is Rodney Neel and I have been working with dogs for almost 10 years. I have always been interested in animal behavior and always wanted to work with dogs. While running my dog training school I have continued my education by attending different schools and seminars. Since I knew that working with animals was my passion, I wanted to learn more and gain experience in the training of working dogs so I searched out the best Dog Training School I could find. After many weeks of searching, I came across K-9 Services Unlimited/Piazza’s Professional Dog Training School in Upstate NY. After talking with Mr. Sal Piazza, I was sure that this was the school I would enroll in. I attended K-9 Services Unlimited and graduated. The months that I spent at this facility were very grueling to say the least. I have learned what it takes to be a great dog trainer. It is great to have now have Sal Piazza as a friend and a mentor. He was able to show me that if you never put money first, but put the dogs and clients above all else that your business will continue to grow. Most of my training was through hands on training and worked with many different breeds of dogs and temperaments. There was never a dull moment. I received my diploma as a Police Service Dog Instructor and I am now serving all of the Metro St. Louis/Southern Illinois area. If you are looking for a dog instructor/Trainer who will give you and your dog undivided attention, please give us a call. My experience and training are second to none. I will treat you with dignity and respect and always get the job done.